A variety of Arizona wildlife species common to the Arizonan deserts may be found around the park. Please remember that wildlife should be given a practical amount of respect and distance for their and our own health and safety. It is important that we don’t interfere in their lives as we enter their habitat and do not give them the opportunity to interfere in ours when we introduce exotic food sources or shelter that may attract them. A 63-entry birding list is available upon request at the Front desk of the Discovery Center. The close proximity of the canyons and arroyos of the Whetstone Mountains, Sonoran and Chihuahuan Desert terrain and the riparian areas of the San Pedro River creates an unique opportunity to see species found in each of these habitats. One of the most common birds seen in the park is the large, dark raven that may present a nuisance when food is left unattended in the picnic or camping areas. 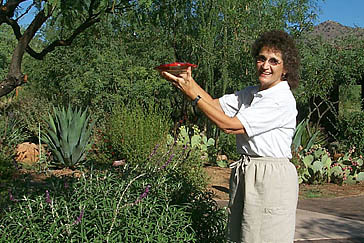 Hummingbirds from around the country converge on Southeastern Arizona during their migratory travels and many may be seen year round in the Hummingbird Garden. Lizards are commonly seen scurrying among the rocks or up a tree trunk. Slow moving Gila monsters, plodding tortoises and racing coach whips may be observed in season. Caution should be taken in warm months not to disturb the several species of rattlesnakes here. To ensure your safety: keep a respectful distance, remain on trails, avoid overgrown areas, use a light to check the warm roadways after dark and keep pets restrained. This should prevent any contact with these important but potentially dangerous desert dwellers. Many colorful butterflies and a number of intricately patterned moths may be observed during blooms in the Hummingbird Garden. Unusual assassin bugs climbing a century plant, large horselubber grasshoppers lumbering across the ground, and walking sticks blending in with the shrubbery will provide a fascinating entomological experience. Caution should be taken for scorpions. See the display in the Discovery Center about the cave-dwelling insects that live in the dark environs of the cavern. Mountain lions range throughout the Whetstone Mountains and precautions should be taken when in camp or on the trail. Coyotes or gray foxes represent the canine species of the park. These animals are seldom seen but since these animal are predators, pets should not be left unattended outdoors, especially at night. Skunks, raccoons, coatimundi, and ringtail cats may present a night time nuisance if food is left unsecured in the camp areas. Jackrabbits, cottontails, squirrels, javelinas and deer may be seen wandering through the park. Of course, bats are also an important element of the cave and park habitat. Common cave bats (Myotis velifer) exit the cave each night during summer months to feed while the maternity colony occupies the Big Room from mid April to mid October. Pallid bats often occupy overhangs on buildings and bridges, Mexican free tail bats chase flying insects and long nosed bats come to feed from the local agave species at night. Please advise park staff of any unusual sightings or unusual behavior by wild animals. Please do not feed wild animals or birds in the park. Avoid leaving food unsecured or unattended outside and place all trash in the appropriate receptacles. This will prevent attracting unwanted animals and insects to your area and leave the animals in their natural state.